When lawmakers returned to Montpelier in January, Campaign for Vermont founder Bruce Lisman called on them to pass sweeping ethics reforms to "keep our elected officials accountable." "Sunlight, in almost all cases, cures problems," he said in a press conference unveiling his proposals. Four months later, as lawmakers are set to leave Montpelier, the Vermont House took action Thursday morning and passed its own, more limited set of rules. By a vote of 136 to 2, it adopted a resolution requiring House members to disclose the names of their employers and any boards or commissions on which they serve for compensation. The resolution also establishes a five-member ethics panel charged with investigating and enforcing alleged ethical violations. At the outset of an hour-long debate, House Rules Committee Chairman David Deen (D-Westminster) made clear that proposing the resolution was in no way an admission of guilt. "I want to say, the Vermont House and its members do not have an ethics problem," he said. "But there's an old bromide that I believe we all know: 'An ounce of prevention is worth a pound of cure.'" 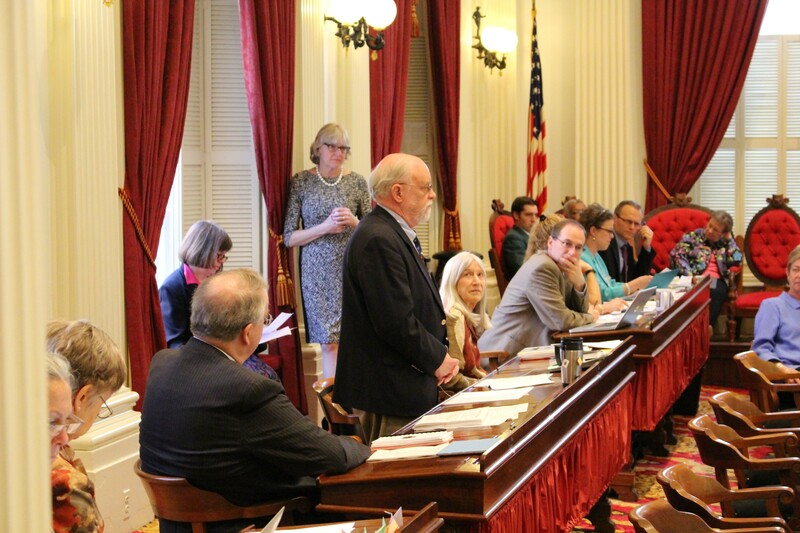 In offering the resolution, he said, his committee and the House Government Operations Committee hoped to address the "ambiguity, confusion and misunderstanding" of ethics rules outlined in the Vermont Constitution and House rules. According to the Constitution, legislators may not "directly or indirectly, receive any fee or reward to bring forward or advocate any bill, petition or other business to be transacted in the legislature." According to House rules, legislators "shall not be permitted to vote upon any question in which they are immediately or directly interested." And Mason's Manual of Legislative Procedure, which the House generally follows, bars legislators from voting on a question "in which they have a direct personal or pecuniary interest." Rep. Don Turner (R-Milton), the House minority leader and a realtor by trade, said he would welcome increased clarity about when he should recuse himself from voting. "I think the people of Milton may know what I do and what I'm involved with," he said, but that might not hold true for everyone in Montpelier. "In the nine years I've been here, I've sat at my desk many times wondering should I or should I not vote on this issue, and I think it's important to provide guidance to all members." But Rep. Alison Clarkson (D-Woodstock) wondered where the House would draw the line. Would legislators who benefit from income sensitivity, current use and state pensions have to recuse themselves from voting on those issues? No, Deen said. Issues involving "a large group of people" who are equally affected by their outcome — such as those Clarkson named — are fair game for lawmakers. Rep. Heidi Scheuermann (R-Stowe), a potential gubernatorial candidate who proposed her own set of ethics reforms earlier this year, said she thought the resolution was "a step in the right direction," but didn't go far enough. "It does not apply to members of the other body. It does not apply to members of the executive branch. And I think we're missing an opportunity," said Scheuermann, who voted for the resolution. "It's important that we have transparency and a code of conduct that's consistent across state government." Cyrus Patten, Campaign for Vermont's executive director, sounded a more optimistic note. "CFV believes it is a step in the right direction," he said. "We are especially pleased that there is language concerning disclosure of employment and compensation as well as the creation of the ethics panel. Although it doesn’t go as far as our proposal suggested, we are pleased the legislature is beginning to take this matter seriously."